NEW TFT COLOR INSTRUMENTS: Full-color 5 in. TFT instrument display that presents both essential and additional rider information from the on-board computer, with six screen styles to choose from, all with high and low contrast settings, adjustable for optimum visibility. NEW ILLUMINATED SWITCH CUBES AND CRUISE CONTROL: Ergonomically-designed switch cubes with stylish backlighting for easy fingertip use under any lighting condition to access functions such as TFT instruments, riding modes, and the new cruise control, significantly improving long distance rideability. 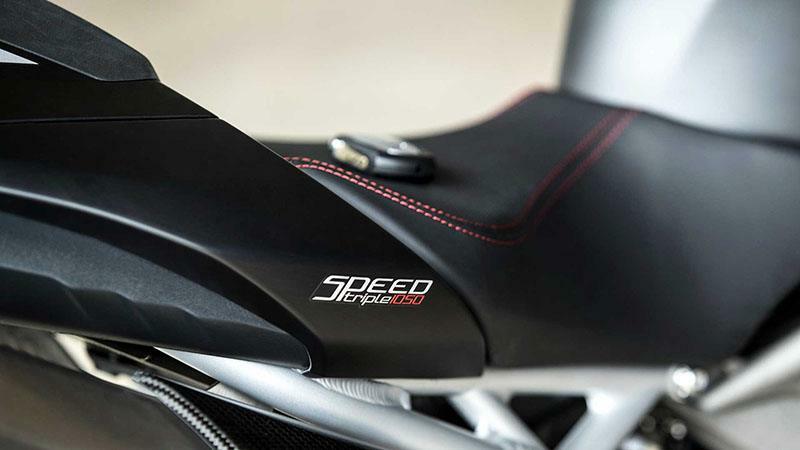 FIVE RIDING MODES: Easily accessed through the left hand switch cube, choose from five riding modes, Rain, Road, Sport, Rider-configurable and Track mode. 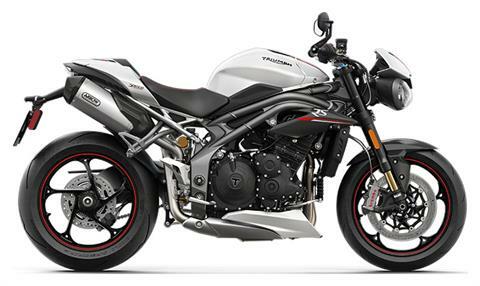 Each altering the throttle map, ABS and traction control to suit the conditions or desired riding style. 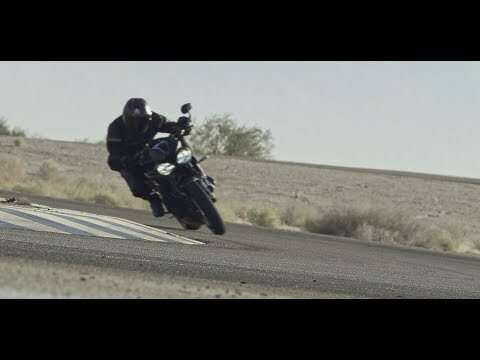 NEW OPTIMIZED CORNERING ABS AND TRACTION CONTROL: Optimized cornering ABS and traction control delivers optimum braking and torque control, improving both straight line and cornering performance. 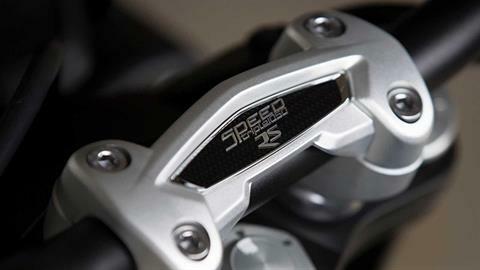 This is supported by a new inertial measurement unit (IMU) which continually calculates lean angle. NEW KEYLESS TECHNOLOGY: The Speed Triple’s new advanced keyless ignition and steering lock system recognizes the proximity of your fob before activation is initiated. For additional security, you can turn off the transmitting signal to disable the keyless function when not in use. MAJOR ENGINE UPDATE, IMPROVED GEARBOX AND ARROW SILENCER: The new RS is lighter, with an enhanced 1050cc engine delivering more power at 148 HP. 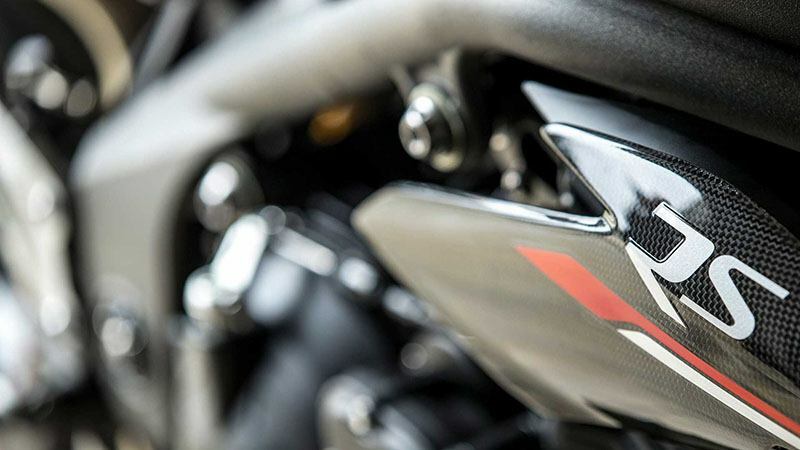 It has a more responsive throttle, improved gearbox, and a premium Arrow titanium sports silencer for an even more ferocious hair-raising soundtrack. 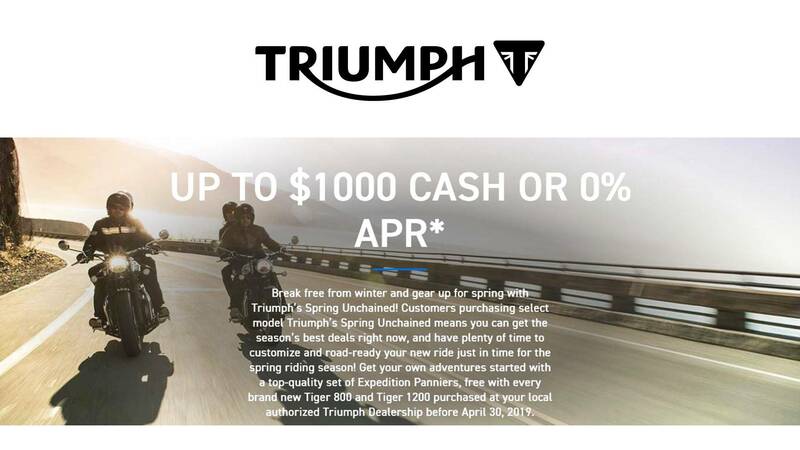 TRIUMPH SHIFT ASSIST: All-new Triumph designed system that enables smooth up/down gear changes without the use of the clutch, reducing rider fatigue. FULLY ADJUSTABLE ÖHLINS SUSPENSION: The RS comes with high specification 43mm Öhlins NIX30 upside down forks and TTX36 twin tube rear monoshock RSU, fully adjustable for pre-load, compression and rebound damping. There’s extra comfort too, with a new rider seat fitted with 3D net inserts. DRL HEADLIGHTS: See and be seen. Daytime Running Lights combine excellent visibility with a confident style statement, and these are fitted into the headlamps with the integrated air intake duct and fly screen for a distinctive front profile. 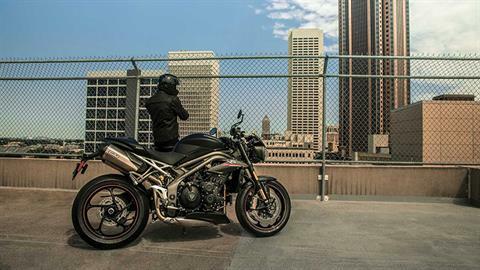 HIGH SPEC WHEELS, TIRES, BREMBO BRAKES: In keeping with the Speed Triple’s uncompromising character, the RS includes new cast alloy wheels with a high-gloss finish, high specification Pirelli Diablo Supercorsa tires and twin disc front brakes with Brembo Monobloc calipers exclusively tuned to reflect the urban sports focus.